Herculaneum VI.22, linked to VI.23. Pondera? Outside the main entrance to the Seat of the Augustales on Decimanus Maximus is an aedicula with marble columns (VI. 22-23), variously identified as a triclinium connected to the Seat of the Augustales, or as the building for the Guardian Spirits of Herculaneum, mentioned in an inscription which commemorates the reconstruction by Emperor Vespasian following an earthquake reasonably placed in the middle of the 70s of the 1st century AD. All’ esterno dell’ingresso principale della Sede degli Augustali sul decimano massimo era un edicola con colonnine marmoree (Vi.22-23), variamente identificata come un triclinio collegato alla sede degli Augustali o come l’Edificio Genii Municipi Herculanei, menzionato in un’iscrizione in cui si ricorda la riconstruzione a opera dell’imperatore Vespasiano in seguito a un terremoto ragionevolmente posto nella meta degli anni Settanta del I sec, DC. See Pesando, F. and Guidobaldi, M.P. (2006). Pompei, Oplontis, Ercolano, Stabiae. Editori Laterza, (p.369). Imperator Caesar Vespasian Augustus, supreme pontiff, holding tribunician power for the seventh time, hailed victorious commander seventeen times, father of the fatherland, consul seven times and designated for the eighth time, censor, restored the Genius of the town of Herculaneum [which had collapsed in an earthquake]. This inscription, preserved in fragments on a substantial marble plaque which was several metres wide, was found in the area of the crossroads between the Decumanus Maximus and Cardo III. Given its fragmentary state, its text is uncertain. According to Wallace-Hadrill, “…. 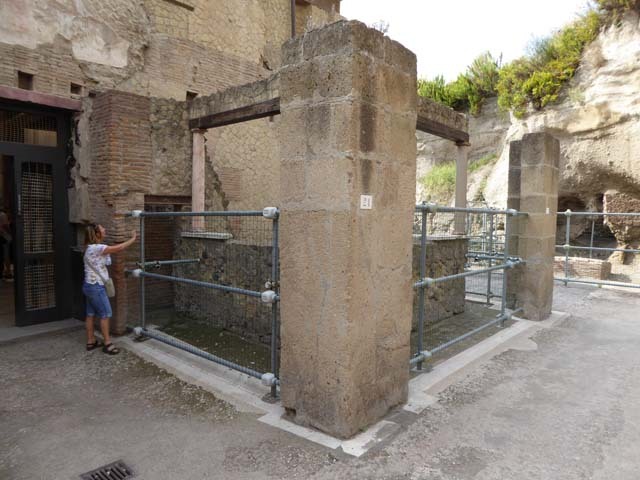 the Weights (Pondera) and the Schola should be the two spaces on either side of the entrance to the so-called College of the Augustales (or Curia). 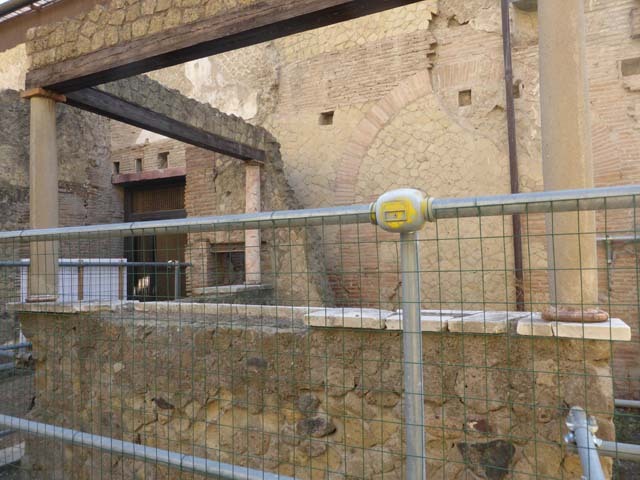 On page 186 is a photo of the exterior of the so-called College of the Augustales, (taken from the area of the crossroad on its western side), with the possible location of the weights and measures office (Pondera) in front. (this would be the area of VI.22-23). 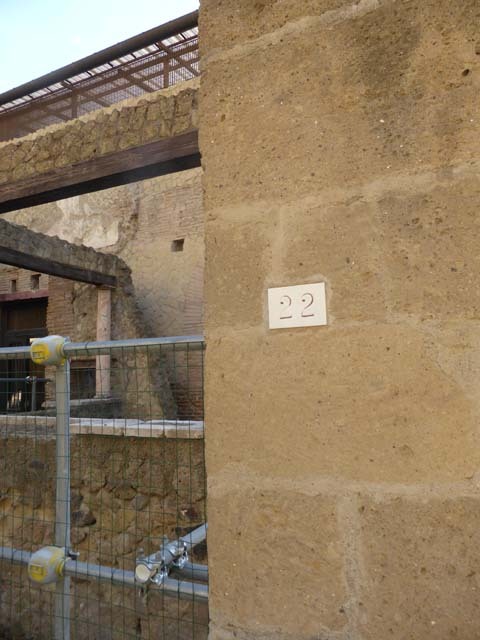 VI.22, Herculaneum, on right, October 2014. Looking towards west side of entrance of VI.21, and aedicula with marble columns at VI. 22-23. 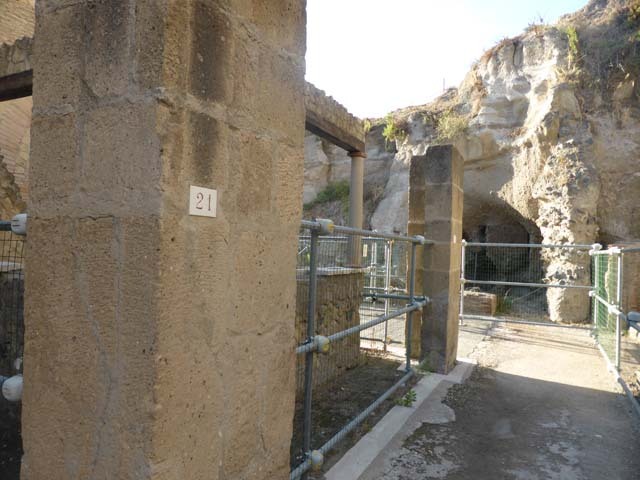 VI.22, Herculaneum, September 2015. Looking south at north end of insula. 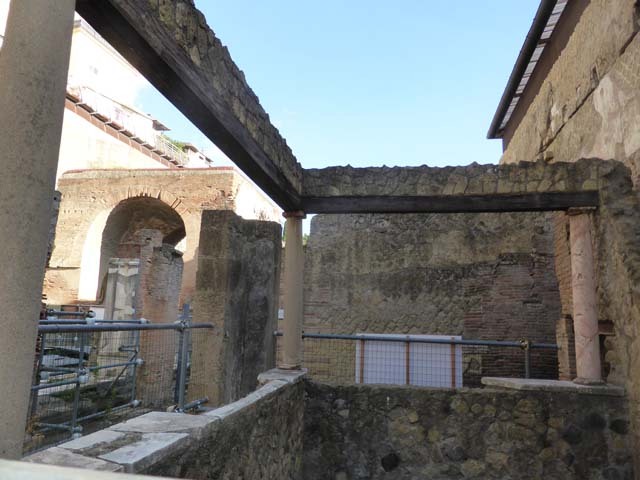 VI.22, Herculaneum, September 2015. Looking south towards three remaining marble columns. 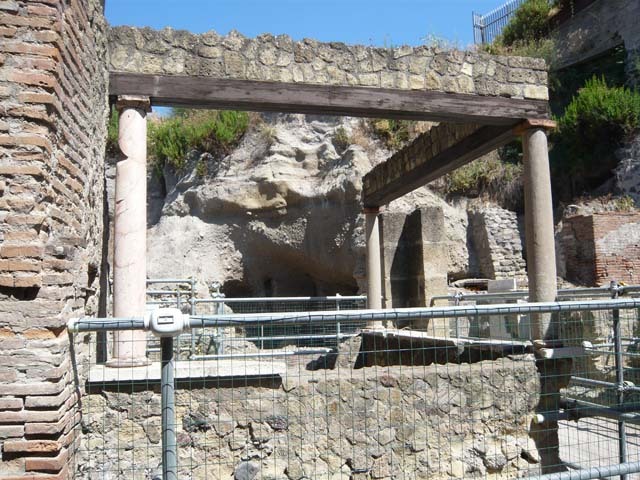 VI.22 Herculaneum. August 2013. Looking west towards three remaining marble columns, from entrance into VI.21. 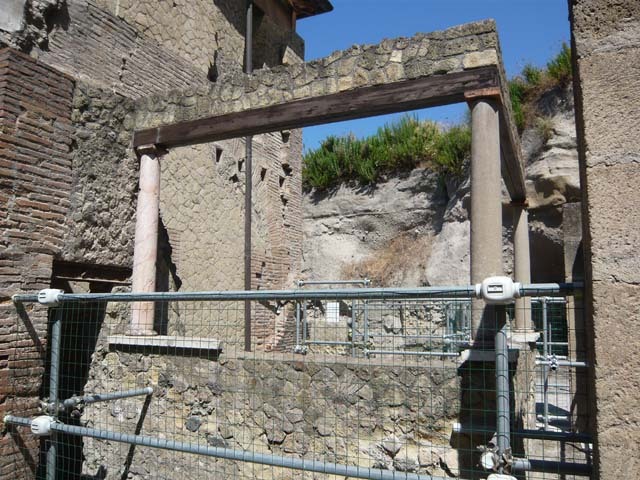 VI.22 Herculaneum. August 2013. Looking west from entrance into VI.21. Photo courtesy of Buzz Ferebee. 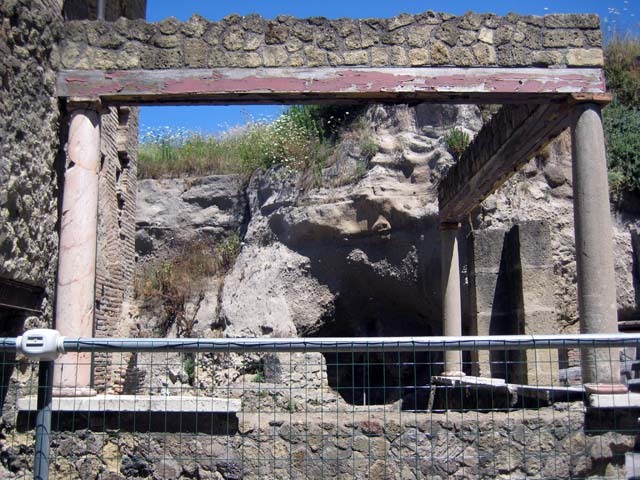 VI.22 Herculaneum. June 2011. Looking west from entrance into VI.21. Photo courtesy of Sera Baker. Looking west along Decumanus Maximus towards the area of the crossroads with Cardo III, at northern end of insula VI, near entrance into VI.21. VI.22/23, Herculaneum, September 2015. Looking east across area at north end of insula, from VI.23.